There is no doubting the fact that India has lowest call rates in the world – Yes, we are far below global average and lower than the lowest when it comes to Voice calls – But is it same in case of Mobile Internet charges? Although, Mobile Internet charges are lower in India than in many countries, there are few countries that not only offer much faster speeds, but also charge only fraction of what Indian Telecom companies charge its users. 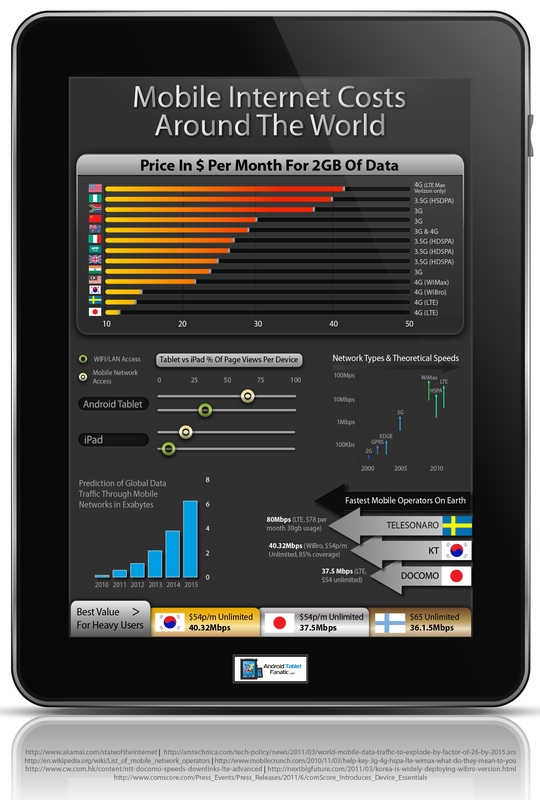 Android Tablet Fanatic has put together a nifty little infographic which offers insights on what Mobile Internet Costs around the World. USA remains one of the most expensive countries when it comes to data usage on Mobile. Roughly, an American user is charged in the region of USD 42 for 2 gig of mobile data usage. Comparatively, Indian Telecom Operators charge close to USD 24 for 2 gb of data usage (Though, I think it is lower and rates will fall further from here). Japan is the cheapest of all countries and the cost is merely 3-4 USD for same amount of mobile data! Guess, I should pack my bags and move to Japan :), What say ? see the charges of internet and technology rating country wise. The story of internet speed on PCs and laptops is still good. But when it comes to access internet on mobile phones, then there comes the real patient person out of you. I mean seriously this is the main reason why Indians don’t prefer internet access on their cell phones in compare to Americans or Europeans. Better to use 2G Internet in a 3g data card at the cost of 100 RS for 6 G.B per month. Speed can be claimed very satisfactionary to watch all videos on Youtube within 2 minutes download. Save Money and use your nous dear Indians Pals.